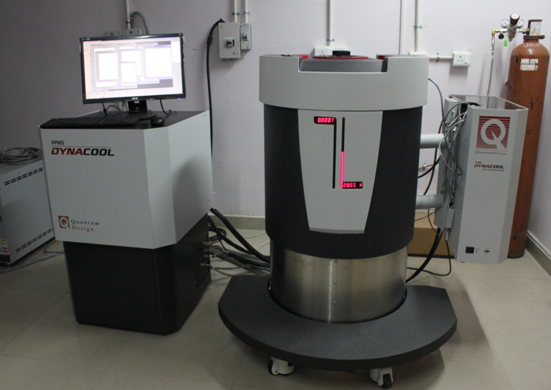 The temperature dependent Powder X-ray diffractometer is built on 9 KW rotating anode x-ray generator with NaI Scintillation counter detection system. Copper anode is used as the target material with fine focus filament as the cathode. Low temperature down to 12K is achieved using closed cycle liquid Helium cryostat. This system has theta-theta goniometer arrangement which keeps the sample horizontal and stationary. The Cross Beam optics technology used in this systems helps in easy changeover from Bragg-Brentano para focusing to high intensity parallel beam geometry and vice versa depending on the application. There is also small angle x-ray scattering unit attached to the system. The attachments for the future installations include high temperature, Grazing Incidence X-ray Diffraction (GIXRD), X-ray Reflectometry (XRR) units. 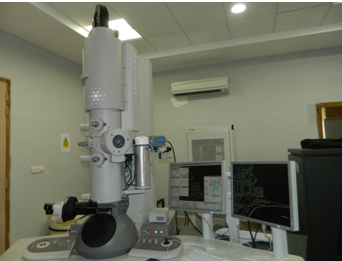 An electron microscope uses high energy electron beams for the illumination of samples, instead of light so that magnification to the tune of a million times (10,000,000 x) and subnanometer resolution can be achieved. Electron microscopes are essential tools for characterizing nanomaterials as they provide an array of information such as topography, morphology, composition and crystallographic information. In the nanoworld, 'believe what you see' and electron microscopes such as TEM provides realistic images of nanomaterials. Infact, one of the major reasons for emergence of the field of nanotechnology is the invention of modern microscopes including the electron microscopes that have very high magnification and resolution in the nanometer length scales. In TEM, high energy electron beam passes through a very thin sample and constructs a two dimensional image of the sample. High resolution TEM can achieve atomic resolution. TEM also can be coupled with EDAX for elemental identification. Crystalllographic information of samples can also be obtained using selective area electron diffraction in TEM. EDS can be used to study chemistry of the materials and to do elemental mapping. 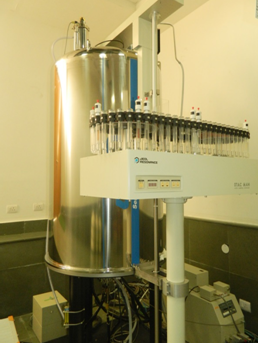 Information about the structure, conformation and dynamics of small and large molecules can be obtained in the solution and solid state using NMR Spectrometer. Apart from common nuclei's like --1H and 13C, we can also record NMR spectra for other active nuclei's such as 19 F, 11B, 15N, 2D, 127I, 207Pb, 7Li, 6Li, 199Hg, 103Rh, 31P, 111Cd etc. Due to recent advances in spectroscopic techniques two dimensional NMR spectroscopy has become powerful tool to derive unique structural information of small and large molecules, some of the most useful techniques include 1H-1H COSY (Correlation Spectroscopy), Double quantum filtered 13C-1H COSY, Carbon detected 13C-1H COSY, Proton detected 1H-13C COSY: HMQC (Heteronuclear Multiple Quantum Correlation), Proton detected, Long Range 1H-13C Heteronuclear correlation: HMBC (Heteronuclear Multiple Bond Coherence), DQF (Double Quantum Filtered)-COSY, 1-D TOCSY (Totally Correlated Spectroscopy), 2-D TOCSY, HMQC- TOCSY, ROESY. The wave nature of light and the associated diffraction not only undermine resolution of common light microscope but also impose difficulty of miniaturizing photonic devices such as fiber optic cable and couplers. In order for light based circuitry to be competitive with current electronic circuits and to overcome the speed limitations of electronics, this size compatibility is a central challenge. Some of these tasks could be carried out by molecular devices such as photonic wires, and molecular switches involving organic fluorophores, inorganic quantum dots, nanoparticles, nanocomposites. Further, the advancement of DNA nanotechnology, in recent years, combined with nanomaterial offers a great opportunity to improve the nanotechnology research, biomedical application and in living cells. Transient absorption (TA) spectroscopy encompasses a powerful set of techniques for probing and characterizing the electronic properties of molecules or materials. This technique is used to study ultrafast photophysical and photochemical processes by monitoring transient states (e.g., excited states, charged species). These states are accessed upon absorption of photons and essentially represent higher energy forms of the system, differing from the lowest energy ground state in the distribution of electrons and/or nuclear geometry. Our femtosecond TA setup consists of a Ti:Sapphire regenerative amplifier (Spitfire Ace, Spectra Physics) seeded by an oscillator (Mai Tai SP, Spectra Physics) as light source. The laser output from the amplifier having wavelength 800 nm, pulse width < 35 fs and energy 4 mJ per pulse is divided into two beams to generate pump and probe pulses. A white light continuum (WLC) probe in the visible wavelength range is obtained by sending a small fraction of 800 nm focused beam through sapphire crystal. Probe is splited into two beams and detected as sample and reference separately to eliminate low frequency laser noises. A mechanical chopper of rotational frequency 500 Hz is used to create the pump blocked and unblocked conditions for the detection. TA spectra is recorded by CCD arrays after dispersion using a grating spectrograph (Acton spectra Pro SP 2358). The most common experimental method of obtaining a detailed structure of a molecule, that allows resolution of individual atoms, single crystal X-ray diffraction (SCXRD) is performed by analysing the pattern of X-rays diffracted by an ordered array of many identical molecules (single crystal). Many pure compounds, from small molecules to organometallic complexes, proteins, and polymers, solidify into crystals under the proper conditions. When solidifying into the crystalline state, these individual molecules typically adapt one of only a few possible 3D orientations. When a monochromatic X-ray beam is passed through a single crystal, the radiation interacts with the electrons in the atoms, resulting in scattering of the radiation to produce a unique image pattern. Multiple images are recorded, with an area X-ray detector, as the crystal is rotated in the X-ray beam. Computationally intensive analysis of a set images results in a solution for the 3D structure of the molecule. This is a next generation high accuracy (sub-ppm with internal calibration), high resolution (40,000 resolving power) tandem mass spectrometer, and ion funnel optics for maximum sensitivity. It's high scan rate allows excellent the characterization of complex mixtures such as with untargeted metabolomics experiments. It is able to obtain high resolution MS/MS spectra at 50 Hz! It has a dynamic range of 4 orders of magnitude and comes equipped with CaptivesprayTM nanoelectropray, conventional flow ESI for maximum flexibility. 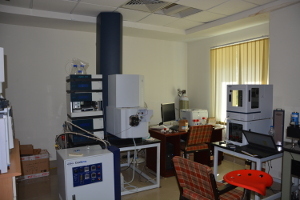 The system is attached with Thermo Fisher LC-MS which is use to identify, characterize and quantify unknown and known compounds within complex matrices, including drug metabolites, environmental toxins and food additives. Our systems enable you to streamline your workflow and obtain more information from every run, from high throughput sample screening to discovering trace levels of unknowns. 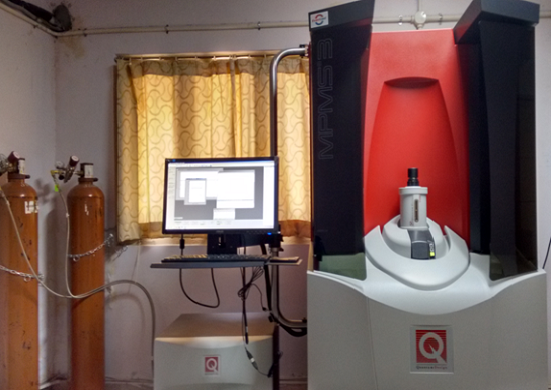 The adsorption/desorption isotherms and pore volumes of the adsorbents were determined by nitrogen adsorption-desorption isotherms, measured at 77 K using Quanta chrome Autosorb 1C system. The samples were degassed at 200oC under vacuum before starting N2 adsorption. Surface area and pore volumes (or pore size distribution) were determined using the Brunauer-Emmet-Teller (BET) equation, Barret-Joyner-Halenda (BJH) and DFT methods respectively. Automatically performed Temperature programmed techniques (TPR/TPD/TPO. Flow-based, pulse titration method for rapid determination of active surface area, degree of metal dispersion.Available vapor generator option with heated manifold for use with water and organic vapors. 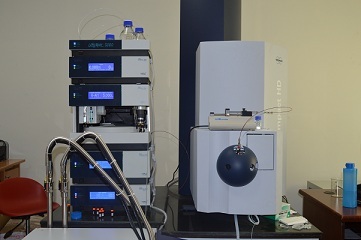 Available, integrated mass spectrometer option for identification of desorbed gases. High sensitivity, thermal conductivity detector (TCD) for TPR/TPD/TPO analysis and automatic physisorption and chemisorption by precise vacuum volumetric method for analysis of BET surface area, meso- and micropore size distribution, active surface area, degree of metal dispersion, heats of adsorption, etc. Rheology is the study of the flow of matter, primarily in a liquid state, but also as “soft solids” or solids under conditions in which they respond with plastic flow rather than deforming elastically in response to an applied force. It is a branch of physics which deals with the deformation and flow of materials,both solids and liquid. Chemisorption is a kind ofadsorption which involves a chemical reaction between the surface and the adsorbate. New chemical bonds are generated at the adsorbant surface. Examples include macroscopic phenomena that can be very obvious, likecorrosion, and subtler effects associated withheterogeneous catalysis. The strong interaction between theadsorbate and thesubstratesurface creates new types of electronicbonds. A PES measurement thereby yields a spectrum of the number of emitted electrons as a function of energy (binding or kinetic). XPS (X-Ray Photoemission Spectroscopy):For XPS, X-Rays are used as ionizing radiation. All elements have their characteristics set of core electron binding energies. As the core electron orbitals have almost an atomic character with regards to molecules and solids, XPS offers a possibility of performing qualitative analysis of sample. The detailed position of the core levels also depend on the chemical state of the probed atom (chemical shift). Being surface sensitive, XPS can be used for studying the chemical status of elements on the surface. It is possible to use PES for quantitative analysis as the surface concentration of an element is proportional to the measured peak intensity of the corresponding core level. However, the intensity also depends on other factors, such as the differential cross section of a particular orbital, instrumental broadening and polarization. UPS (Ultraviolet Photoemission Spectroscopy): For UPS, Ultraviolet Radiation is used as ionizing radiation. Being less energetic, ultraviolet radiation is highly surface sensitive. Ultraviolet photons are produced using a gas discharge lamp, filled with helium. As lower energy photons are used, most core level photoemissions are not accessible using UPS, so spectral acquisition is limited to the valence band region. XPS: X ray photoelectron spectroscopy (XPS) is a surface sensitive quantitative spectroscopic technique that measures the elemental composition of the materials. 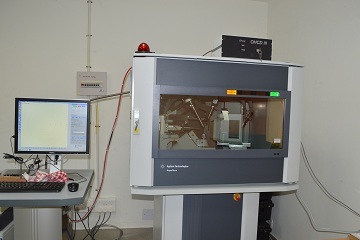 XPS spectra are obtained by irradiating a material with a beam of X-rays while simultaneously measuring the kinetic energy and number of electrons that escape from the top 0-10 nm of the material being analysed. It requires high vacuum conditions. XPS can be used to measure the elemental composition, empirical formula, chemical state and electronic state of the elements in a material. UPS: Ultraviolet photoelectron spectroscopy (UPS) operates on the same principles as XPS, the only difference being that ionisation radiation at energies of 21.2 eV (He I) and 40.8 eV (He II) are used to induce the photoelectric effect. Ultraviolet photons are produced using a gas discharge lamp, filled with helium gas. UPS can be used to study valence band spectra, position of the Fermi level and for work function measurements. ISS: Ion scattering spectroscopy (ISS) is a technique in which a beam of ions is scattered by a surface and the kinetic energy of scattered ion is measured. Peaks are observed corresponding to elastic scattering of ions from atoms at the surface of the sample. Each element at the sample surface produces a peak at a different measured kinetic energy, caused by the momentum transfer between the incident ion and atom. The scattered ion and the scattering atom are normally of different masses. But the total momentum of the atom and ion is conserved. Therefore as the initially stationary atoms recoils, some kinetic energy is lost from the scattered ions, and quantity of lost energy depends on the relative masses of the atoms and ions. The technique is uniquely sensitive to the outermost layer of the surface and is complementary to SIMS (secondary ion mass spectrometry). Typical uses include contamination identification, surface segregation and atomic layer deposition (ALD) studies. ReeLS: Reflected electron energy loss spectroscopy (REELS) is a specialized technique that is usually performed as an adjunct to Auger electron spectroscopy (AES) using the same instrumentation but much lower primary electron beam energies (100 ev to 3 kev). It involves analyzing the energy distribution of those primary beam electrons which have been reflected back from a solid sample with well defined energy losses from the initial energy, E0. This technique can be used to study the composition and atomic coordination in surface layers of a material. Depth profile measurement Monatomic depth profiling uses an ion beam to etch layers of the surface or surface contamination, revealing sub-surface information. Combining a sequence of ion gun etch cycles with XPS analyses provides quantified information as well as layer thicknesses. Before removing material from the sample, a spectra or a set of spectra, is recorded from the surface of the sample. The surface is etched by rastering ion beam over a square of rectangular area of the sample. After the cycle, the ion beam is blanked and another set of spectra is recorded. This sequence of etching and spectrum acquisition is repeated until profiling has proceeded to the required depth. Hence, this technique is best suited for investigating the different layers on a multi-layered material, including thin films. 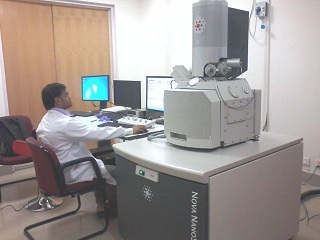 Raman spectroscopy is based on inelastic scattering of monochromatic light, usually from a laser source. 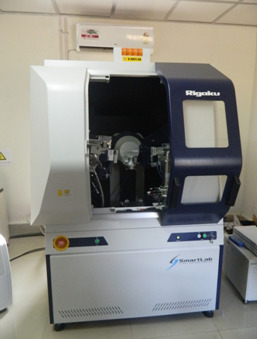 Raman spectroscopy can be used to study solid, liquid samples. We have 325 nm, 532 nm, 633 nm and 785 nm lasers . 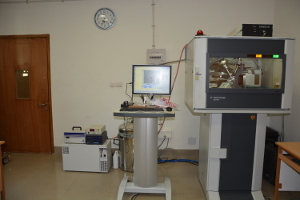 It could be used for general materials characterization and also investigate defects, strain etc. Raman spectra could be recorded both in low and high temperature. 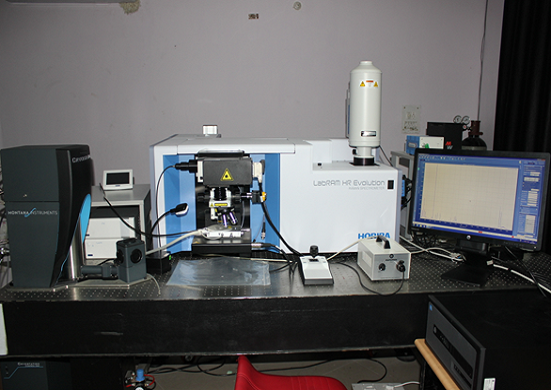 Raman mapping also could be also done with our Raman spectrometer. 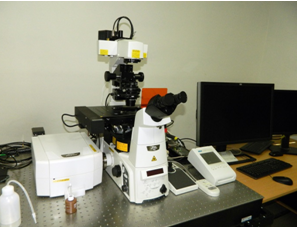 In addition, we also have photoluminescence (PL) setup for studying luminescence properties of materials at low and high temperatures. MPMS is a very sensitive magnetometer due to the utilization of a liquid Helium cooled SQUID( Super conducting quantum interference device) to measure changes in the magnetic flux which is converted to and measured as current, as the sample moves through the superconducting detection coil. The instrument is used to study the magnetic properties materials at temperatures from 1.8 to 400K under magnetic fields up to 7 Tesla. It is possible to measure materials in powder, single-crystal or pellet form. Three possible measurement modes are AC susceptibility mode, DC scan mode and VSM mode. The Physical properties measurement system (PPMS) is an automated low temperature and magnetic field system for the measurement of material properties like specific heat, and both thermal and electrical transport properties. It uses He gas flow for rapid temperature cycle and accurate temperature control. Temperature range is 1.8 K-400K. 0 to 14 Tesla magnetic fields is used.